Can I just say how insanely jealous I am of natural redheads? It is just SO gorgeous. I've always loved red hair, and ever since Brave came out, I've dreamed of being a fiery redhead with MASSIVE curls. And also with a Scottish accent. Because why not go all in, ya know? Anyway, one of my main homies, Emilie, has STUNNING red hair, so I bamboozled her into being my makeup model for a few hours. She doesn't wear a lot of makeup and doesn't get too adventurous with her makeup because she doesn't want anything to clash with your hair, so it got me thinking. I have SO much fun doing makeup on redheads because of their hair color, and I don't think that your hair color should limit what you use makeup-wise. If you have red hair, definitely read on for my essential redhead makeup tips (my favorite products for redheads will be coming up soon, too!). Green eyeshadow is going to look GREAT on you. Green and red are complementary colors, which means they look good together. I love using olive green eyeshadows on redheads. On Emilie, I used MAC's Sumptuous Olive eyeshadow, which is the perfect, wearable green eyeshadow. You CAN wear red lipstick, but you do need to find the right shade of red so it doesn't clash with your hair color. I love a deep burgundy-brick red lipstick on a redhead. I also think that coral lipsticks look amazing on redheads, too. You can also wear pink lipstick! Pink lipstick can be really unexpected and awesome on redheads, so if you're feeling feisty: DO IT. One of my favorite redheads, Emma Stone, has rocked an awesome pink lipstick before and it looks amazing on her. If she can do it, then so can you! Red hair can really enhance the pink undertones in your skin, so if you have pinky undertones, use a yellow-based tinted moisturizer to even out your skin tone. Have fun with it! Experiment and figure out what works best for your hair and skintone. Red hair can vary greatly, from strawberry blondes to auburn-hued, so different things will work for different kinds of redheads. And you won't know what works for you until you've tried it. Remember: makeup is supposed to be fun, so have fun, make some mistakes, and, ultimately, learn from your mistakes. So now I gotta know from my redheaded beauties: what are some of your favorite redhead makeup tips? Any colors you absolutely stay away from, and any colors you consider essential for you? Let me hear it! As a redhead, I definitely don't limit myself to colours. I think seeing celebrity redheads pull off great lip shades made me more confident. And I mean, what's better than a bold lip? I find purple can also be a super great shade for gingers. Not bright purple mind, but a nice deep purple. Great post! Amen about the bold lip!! Ahh so true- a deep purple on a redhead is just STUNNING. Thanks for the tip, glad you enjoyed the post! I'm a redhead too, and I find I can wear almost anything except maybe a blue-red. Fun post with great tips! Yes blue-reds can definitely be a tough color to wear if you have red hair. Thanks, Allison! You did a gorgeous job on Emilie! 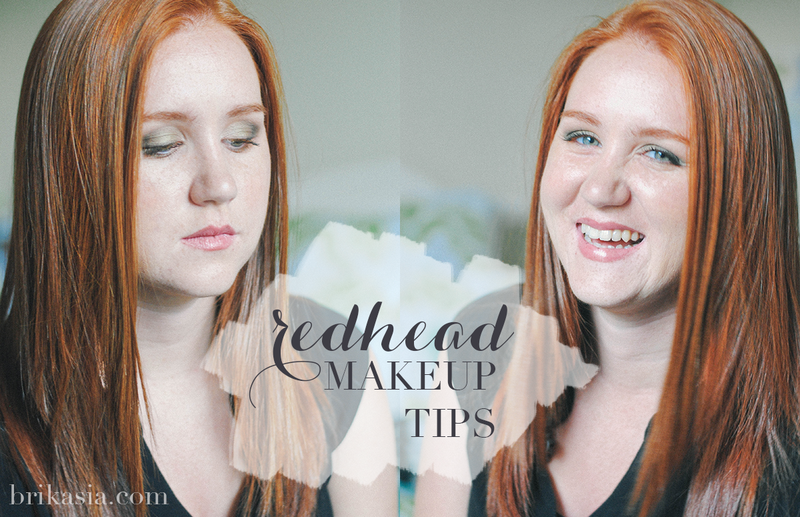 Great tips for redheads! My natural hair color is dark brown, but by the hot Los Angeles sun gives my hair a lightened and reddened effect. I have cool tones skin- so I have to be careful to balance out my warmer hair with my cool skin. I can achieve this by carefully selecting makeup that bridges the gap between the two. I've always wished I was a redhead too! I'm always dyeing my hair different red shades. A bold lip is a must! I've done red highlights before but they just fade sooo quickly! But I agree- bold lips are da bomb. GREAT tips! I've been considering adding some red into my hair and I know I'll have to change up some of my looks! Your friend has amazing hair! I agree! I wish I had it! Glad I could help, Betzy! Thanks! And I'm the same lol. Love red head makeup, it can carry amazing colors. From time to time I have 'faux' red hair, but you really can't beat the real thing. Your friend has gorgeous hair! Oh girl I'm so with you on that one. Faux red is so hard to maintain! I will! And I do too lol! Absolutely beautiful hair. :) Emilie looks fabulous - gorgeous! Great tips. I used to want red hair when I was younger. I love red hair too. It's just sooo pretty! I looooovve redheads as well! Such a gorgeous hair color your friend has :). I knowww! I'm so jealous of her hair color.